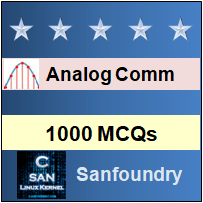 This set of Analog Communications Multiple Choice Questions & Answers (MCQs) focuses on “Pre Emphasis and De Emphasis”. 1. Super heterodyne receivers needs an extra circuitry for frequency conversion. Explanation: Super heterodyne receiver mixes the incoming signal frequency with the locally generated signal frequency, using a mixer, in order to convert the incoming RF signal to a low frequency signal which can be processed easily. It has better sensitivity and selectivity but it needs an extra circuitry for frequency conversion. 2. Neper is ________ decibel. Explanation: Neper is a unit used to express ratios, such as gain, loss and relative values. One neper is equal to 8.685 dB. Hence it is greater than dB. Explanation: Stoneman transmission bridge is used in telephone communication to separate voice path from signal path and battery. Capacitive coupling is used in it. 4. Which statement is true about Square Law modulators? Explanation: In amplitude modulation, the amplitude of the carrier wave is varied with respect to the instantaneous amplitude of the wave to be transmitted. Square Law modulators are generally used for generation of amplitude modulation. They have nonlinear current-voltage characteristics. They are highly nonlinear in low voltage region. 5. Which statement is true about ring modulator? Explanation: Ring Modulator is used for generating DSB-SC waves. It is a product modulator having four diodes connected in the form of a ring, which suppresses the carrier and allows only the two sidebands to be passed. 6. In ergodic process, ensemble and time averages are identical. Explanation: In ergodic process, ensemble and time averages are identical to each other. 7. What is the amount of information in continuous signal? Explanation: In any continuous signal, the amount of information that comes out is always infinite. Explanation: AVC stands for Automatic Volume Control. It automatically adjusts the volume of an audio signal to make it better and also to compensate noise to some extent. Explanation: As per standards audio frequency range lies in between 20 Hz to 20 KHz. This is the human audible range. 10. What is Carrier swing? Explanation: Carrier swing is defined as the total variation in frequency from the lowest point to the highest point. It is equal to two times frequency deviation of the FM signal. However, Frequency deviation depends on the amplitude of the modulating signal.